So when you go three months without posting anything substantial on your blog, you start to get an itch to jump back in there but....where the heck to start? New meal plan? Pick up where I left off on my cookbook review? It's St. Patrick's Day, so um...maybe something green? I found this recipe already queued up and ready to go so I thought it as good a place as any. A quick and easy chicken dish with a luxurious wine cream sauce to spoon over top. Soooo....are we still friends? Sprinkle each chicken breast with salt and pepper. In a large skillet, heat the olive oil over medium high heat. Add the chicken; saute until cooked through, 10 to 12 minutes, turning once. Transfer to a plate; keep warm. Pour the wine into the hot skillet; cook, stirring until reduced by half, about 1 minute. Whisk in the cream, mustard and herbs. Whisk until thickened for about 2 minutes. Pour any accumulated chicken juice into the sauce. Right before serving, drizzle the cream sauce over the sauteed chicken. I'm really thinking of starting a page for recipes with "Little Effort" since I'm all about them. This chicken was really fantastic and could easily fit under that category. I chose to use basil in my cream sauce where the original recipe said tarragon. I'm really not a tarragon fan since it has a really strong black licorice flavour so I subbed in the basil which is slightly licoricey, but mellower and sweeter, and I thought it worked perfectly. Throw some broccoli in a steamer or asparagus in the oven and you've got a minimal effort, big flavor, fancy-ish sorta meal. 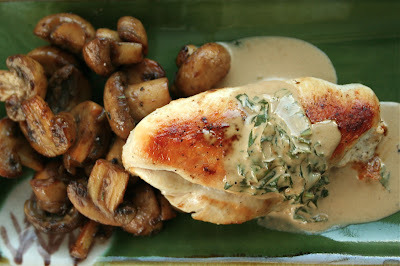 Although, those sauteed mushrooms were divine with this chicken too. Welcome back! 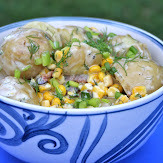 I discovered your blog back in December and have made a number of your dishes with great success! This recipe sounds lovely. Welcome Back! I too recently stumbled on your blog. I was really in a cooking funk and felt we ate the same things over and over. I made the last 2 meal plans that you posted and they were fantastic. I have sent your blog to 5 of my friends and family. Yippy-You are back! I love your blog (found you in January) and your recipes. Cannot wait to try this one. :) I did not know what gremolata was until you. Aww, thanks for the kind words everybody! Hooray! I've missed having meal ideas from your blog!! This looks FANTASTIC, I can't wait to give it a try!!!! I love the idea of the "Little Effort" category. Going on mat leave for the third time and little effort with big taste is a huge deal for me.